What Will You Do for the Cure? We all want a cure for cancer. We walk, we talk, but things don’t change. Scientists have great ideas. They come up with vaccines, therapies and tests that will help your doctors to determine if a suggested treatment will work. But, they need our help. Below is a guest post from a lovely and determined scientist. It is a plea for help…yours. Ann believes that the biggest contributions any patient can make towards the race for a cure are to donate his or her own tumor for research and to share experiences with genomic testing. I am a huge supporter of options and education. To win this war, we need it all….we need conventional treatments with nature’s support. We need to take advantage of every available tool. Thank you Ann, for your commitment to fighting this disease. Once in a while, I humor my husband by watching an NFL game with him. I can’t say that I was following the game closely when it wasn’t the 49ers playing, but one really doesn’t have to follow the game too closely to realize that there is a lot of pink in the field these days. To me, this speaks volumes about the collective power of the cancer patient community. Every cancer patient I know wants to join the fight against the disease. Millions of people walk because that seems to be the single most concrete action to make a difference. I’m here to tell you, you don’t have to walk 60 miles or wear pink. There are other ways. Until recently, I’ve been actively working on finding new cancer therapies for triple negative breast cancer. One of the biggest huddles I faced was that we often do not have enough tumor samples to estimate the frequency of a particular mutation in the population. This makes it challenging to interpret the significance of novel mutations. To complicate the matter further, perhaps the best way for us scientists to figure out what went wrong in a tumor is to compare it with a group of normal tissues. As you can imagine, it is extremely difficult to get normal samples; for the obvious reason, normal people do not donate their tissues. While there are certainly ethical considerations associated with asking for a biopsy from a normal person, I believe the single biggest contribution any patient can make towards the race for a cure is to donate his or her own tumor for research. Secondly, one thing that attracts me most about cancer research is the incredibly fast pace the field is moving. Cancer scientists and oncologists are always in the frontier of technology development and application. It is thus not surprising that the genomics and personalized medicine fields find their first home with oncology. In cancer treatment, personalized medicine makes use of various genetic biomarkers and diagnostic tests to identify tumor subtypes and predict an individual’s response to various therapies (See MammaPrint example below). This process is immensely helpful and cost-effective because it can predict which chemotherapies a patient is likely to respond or not respond to. Since genomics itself is a rather young field, there exist multiple barriers to wilder adoption of the relevant diagnostics. Among those barriers, lack of education and ambiguity about reimbursement are the two biggest factors. Until now, efforts for such education have been sparse and un-centralized. This is the problem we are tackling with BioInformative. BioInformative is a Portal where doctors, scientists and patients can contribute scientific information and reviews about these diagnostic tests. You can think of it as a hybrid of Wikipedia and Yelp, but instead of a dining experience, it’s for a life-saving cause. Anyone with first-hand experience with these tests is invited to review them – and that means YOU. We envision that guidelines for treatment and reimbursement policies will emerge naturally from this grass-roots movement. MammaPrint (offered by Agendia) is an example of the new class of genomic diagnostic tests. The major difference between these tests and previous genetic tests (like BRCA1) is in the scale. This new class of test can measure the activity of 1000+ genes or all genes in the genome. They can thus better characterize each individual tumor and offer more information for treatment choices. There is much to be done in the race for the cure. You can walk for 3 days or type in the comfort of your own home. The latter option is less glamorous, but, in my opinion, is much more effective. Perhaps it is an excuse for my geeky self to hide behind my computer, but at the end of the day, we cannot buy tumors (actually we do, but they’re very expensive!) any more than we can buy lessons learned from other survivors. So, would you join me to be bioinformed? 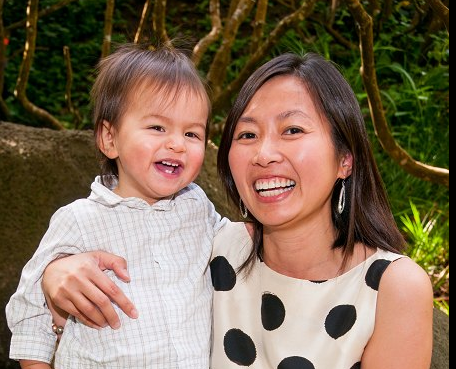 Ann Mongan, PhD., is a cancer genomics scientist, mother of a silly baby boy, and wife to a radiologist. She has strong research interest in developing new cancer therapeutics and personalized medicine. You can find her other similar articles or reach her at www.bioInformative.com.